Happy Summer! I hope everyone is enjoying some time outside soaking in the beautiful summer light and getting some extra time with friends and family. So, not to keep you from your summer fun, I will keep this short. I just have a couple of things I wanted to share with you! I am happy to share with you this first peek at the new calendar I am creating! The image for 2019 features Vrksasana or Tree Pose. These are a limited edition of thirty. They are printed on handmade watercolor paper with a deckle edge and measure approximately 12″x18″. I am selling them loose, so you may choose how you want to hang them, possibly in a frame or with fancy clips or any other creative way that strikes you! I do use water based inks and cut paper, so you would want to hang them in a way or a place that is away from water. The calendar will officially go on sale on Saturday, July 28th at my booth at The Wild Vibes Festival in South Berwick. I made a few ahead of time to sell on event day, but will also be taking orders. They are $60. unframed and again, are a limited edition of thirty. So, once they are all sold, I will not be making this same design. 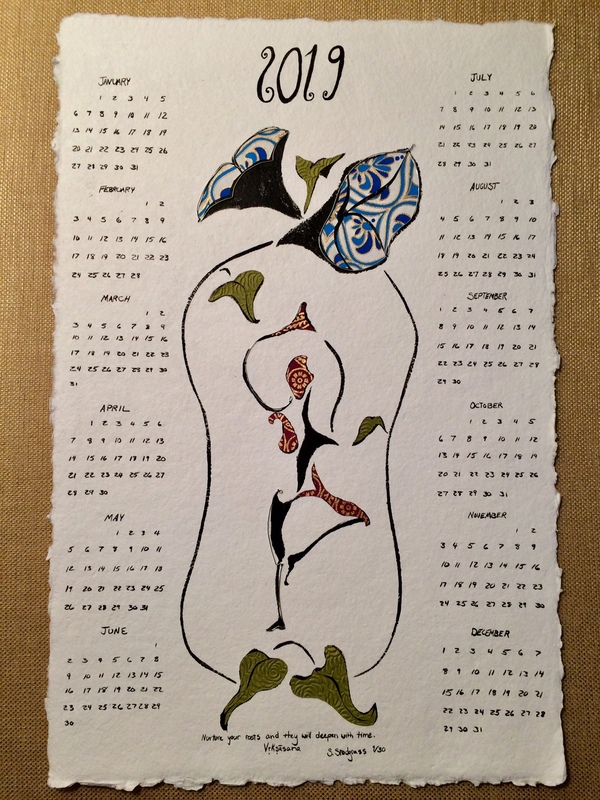 A feature of this design is that if you would like to continue to display the image after the end of the year without the calendar days, you may easily have it matted to feature just the artwork. Feel free to email me with inquiries or if you are interested in ordering! Morning Slow Flow at Windpointe Barn continues on Wednesdays throughout the summer from 9-10am with the exception of this week (no class on July 18th). I wish you long summer days to savor and time to be creative with the practices you love!